to spreadsheets by adding the ability to add, edit, sort, and filter rows. Today, I'm happy to announce that this same list view is now available when you're working on spreadsheets from desktop and notebook computers. You can find list view under the View menu. Imagine that you collected 100 names and t-shirt sizes using a Google Docs form. You might share a list view of the form responses, allowing people to fix errors (such as someone entering the wrong size) without worrying about a novice user accidentally messing up other parts of the spreadsheet. Rather than embedding a published snapshot of a spreadsheet in your Google Sites page, you can now embed a read-only list view of the spreadsheet, which allows users to easily sort, filter and page through the data. List view also loads very quickly in your browser, making it especially useful when you just want to quickly give others basic editing access rather than the full functionality normally available. 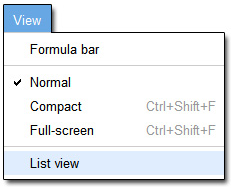 And if you're using list view and need full spreadsheet functionality, just follow the "Go to spreadsheet view" link. A few weeks ago we enhanced mobile access to spreadsheets by adding the ability to add, edit, sort, and filter rows. Today, I'm happy to announce that this same list view is now available when you're working on spreadsheets from desktop and notebook computers. You can find list view under the View menu.